This gold and garnet lentoid plate is one of a couple found in the summer of 2009 in a field in Staffordshire by metal detector. It is part of a great collection of gold and silver objects, many of which are now being prepared for national and international exhibitions starting this summer. The lentoid plate measures circa 52 mm x 75 mm, it is about 5mm thick and weights over 38g: This makes it a remarkable object in the collection, which also comprises a large number of very small fragments and loose garnets. 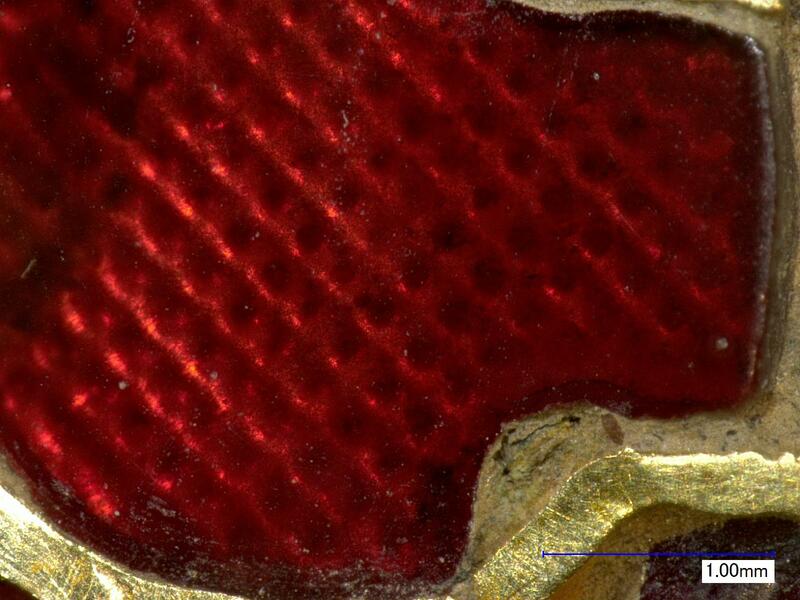 The lentoid plate has suffered much damage, with bending and breakage of its metal parts leading to loss of garnets, but the number of original cells is estimated to be 239. Each cell would have contained one individually cut garnet. Because it was found in the ground, this object was brought to the conservation studio covered in soil obscuring much of its surface detail. A meticulous cleaning operation allows us to finally see what lay beneath that soil. 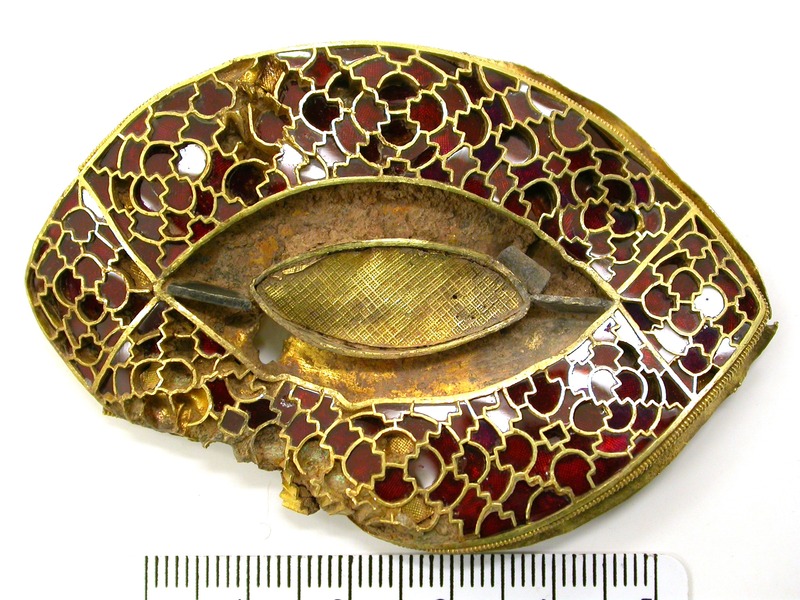 Like for most of the hoard objects, the construction of this piece is quite elaborate: the “eye” shaped base is made of a sheet of gold to which construction details such as borders and cell walls were attached, most probably by a process called eutectic soldering . There are three rivet holes at the back, two of which still contain portions of the rivets. The cells: these are thin, mostly short strips of gold shaped and soldered to the base to form individual settings for each garnet (image 1 ). It is very likely that the bottom of these cells may have contained a material used to fill them up and support the garnet and its backing foil. The lentoid plate features a very large almond shaped cell in the centre (image 3), which is likely to have contained a decorative stone. The garnets: there are a variety of garnet shapes and sizes in the hoard, but their average thickness tends to be between 1.1-1.2 mm. All the garnets on this object are red (image 2), and because this is a rather resilient silicate stone, most of them look as shiny as new! 197 garnets are present on the lentoid plate. 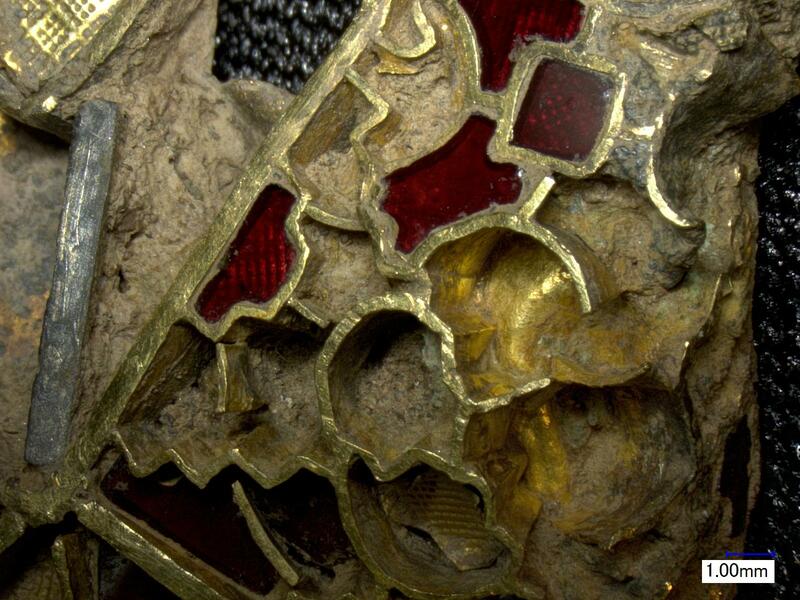 The backing foils: As a perfectly cut and polished garnet wasn’t shiny enough, the Anglo-Saxons added to the effect by backing each stone with its own individual gold foil. 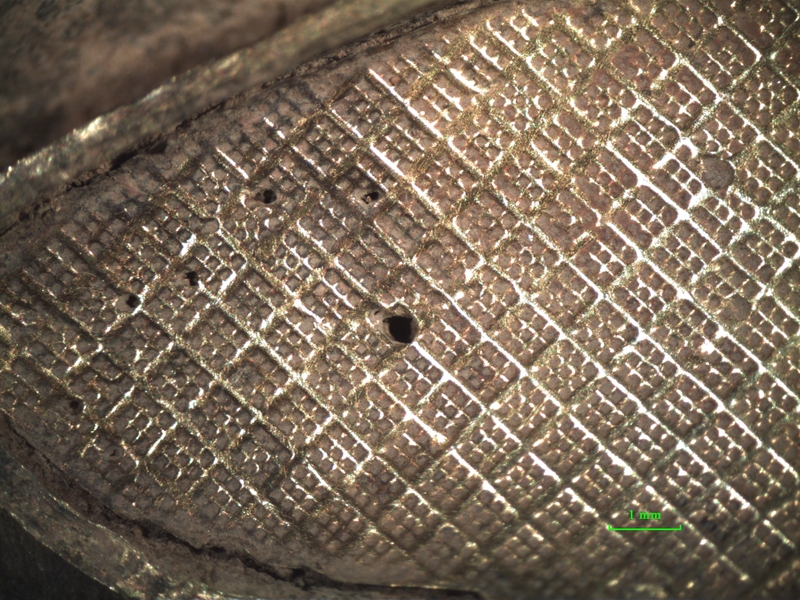 The waffle pattern, stamped on the extremely thin foils, is microscopically small. The central almond shape cell, having lost its stone, offers a view to one of the largest backing foils in the collection. The beaded wire: A double row of beaded wire or filigree runs around almost the entire perimeter of the object (image 4). According to measurements carried out using a microscope fitted with picture capturing software, each wire is circa 0.38mm wide. Filigree even finer that this was widely used as a decorative technique by the Anglo-Saxons and the Staffordshire Hoard as a whole offers many splendid examples of this. The composite nature of the hoard objects makes them often structurally unstable (fragile, in other words); the lentoid plate is no exception. The lifting of soil to reveal the surface can cause the garnets beneath it to become loose; that is why sometimes the removal of soil is only partial, as compact soil can provide much of an object’s structural cohesion . Moreover gold, and especially gold as pure as this, is quite soft and easily scratched, therefore the tools for its cleaning must be chosen carefully. As a rule, no metal tools are used for the cleaning of objects in the hoard. When conserving this object care was taken not to contaminate the surface with any material or treatment which may hinder future analysis. One of the reasons why many of the objects are not perfectly clean is that the level of conservation was decided with the needs for future analysis and study in mind. The adhesive used to secure the unstable garnets is reversible, in other words, it can be undone quite easily if needed. The lentoid plate took over 50 hours to conserve, including bench work, photography, study and consultation and report writing. More than 40 samples of soil, associated fragments and corrosion products were taken from its surface and may help scientists understand the object’s history and burial environment. This is the question that we conservators, as well as our curatorial colleagues and research panel are asked on an almost daily basis. A potentially embarrassing question, since the unprecedented nature of many of the hoard objects means we have no existing similar specimen to compare our objects to, in order to help our interpretation and understanding. But rather than shrug our shoulders and look baffled we try to make informed hypothesis, we talk to the experts and we interact with the public who are keen and interested in the subject and whose comments sometimes can open new and interesting avenues. The interpretation of the original use of the lentoid plates is still very much open to debate. Could it be part of a helmet or armour decoration? Was it used on a man or to decorate a horse’s armour? Investigative Conservation, edited by David M. Jones, English Heritage Publishing. Product Code: 51411. Free PDF available online. Please do not miss the chance to admire this and many other objects while they are on exhibition this summer; not only because the Hoard team has worked so hard to make it happen, but most of all because this is a collection of truly remarkable, unprecedented artefacts. The sites at Stafford, Lichfield and Tamworth are going to provide fantastic locations for the exhibitions starting in July 2011. See more details of the 2011 Tour. Deborah Magnoler, Conservator, Staffordshire Hoard Conservation Team, Birmingham Museums and Art Gallery. Hi, fabulous research work you’re doing on the Staffordshire Hoard and even better that you’re sharing the development work with us. I have a question re. the excavation. The metal detector helps to find the metal objects, but how do you go about finding the precious stones and small fragments of other non-metal objects that must be left in the ground? Hello Donna, thank you very much for your interest and apologies for the delayed answer to your query: as I wasn’t there at the time of excavation, I’m afraid an archaeologist or our curator David Symons would be better suited to answer your question about any non-metallic objects left in the ground. There is literature out there (Antiquity Vol. 85 Number 327, March 2011, Martin Carver Ed. is a special issue dedicated to the Hoard in the qurterly review of world archaeology)describing the thorough fieldwork by Staffordshire County Council and Birmingham Archaeology, which included magnetometer and resistivity surveys and the systematic excavation of test-pits and trial trenches extending over a large area: a total of 152 m2 was excavated to ensure that all items, even the smallest, were recovered. This is a fabulous piece, equal to the best of Sutton Hoo and Kent. It looks like it has been torn off something and may be related to the gold and cloisonne strip, but what? It does not look like a brooch. Are we seeing pieces torn from saintly relics in churches or cathedrals such as Rochester or robbed from the graves of Kings, perhaps King Offa’s own burial mound or chamber. He was a great and proud King, who certainly thought himself the equal of Charlmagne, if not a little better!. It’s curious that we have no knowledge of a burial chamber for King Offa or King Ethelbert of Kent. The latter may have given much of his jewellery to King Redwald of East Anglia as a bribe to persuade him to convert to Christianity, possibly some of the Sutton Hoo treasure. I don’t think King Offa would have shunned earthly wealth so I think I would relate this piece and the garnet and gold strip to him – perhaps funeral shield decorations. This is certainly a very impressive piece of work, definitely as good a quality as anything that has been found before. 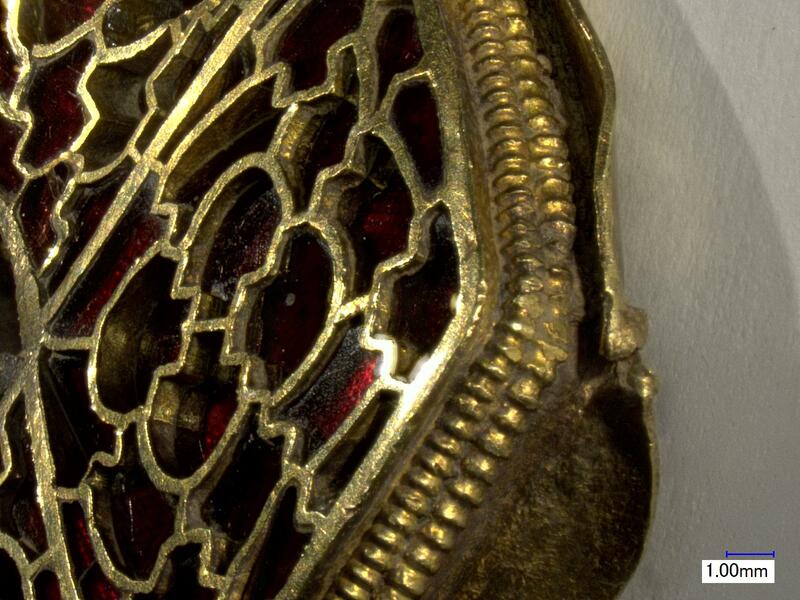 It is not a brooch, as it shows clear evidence of having been attached to another object. However, the big question is what that other object was. To try to answer this we need to consider more than just this one piece. K270 is one of a pair with K843, so we have two of these eye-shaped or lentoid mounts. These look as if they are related to another pair of mounts, K653 and K654, which have been described as being shaped like a cat’s ear or a shark’s fin. K270 and K843 are also clearly related to three cloisonné strips (K663, K668 and K673) which all have a curved rather than straight edge at one end. The curve of the mounts matches exactly the curvature of the pointed end of these strips. Details of their decoration suggests that a number of other cloisonné strips (K1, K643, K681, K712 and K1313) may also belong to this group, and there is every chance that we will add to this list as the cleaning of the hoard continues. So, we may be dealing with a group of four mounts and at least eight strips of one sort or another (but do they all come from just one object?). Whatever the mounts come from (a shield, a reliquary, the leather binding of a Bible, or something we haven’t even thought of yet), we can at least say that it must have looked absolutely magnificent. I think we can be sure that these pieces are not associated with Offa, though. The proposed date for the deposit of the hoard is about 670-700, which is about a century before Offa’s time (he ruled 757-796). Curator at Birmingham Museum and Art Gallery, Staffordshire Hoard Research Advisory Panel. Yes, David, I think you are right about Offa. I should have been thinking of King Aethelred who raided Northumbria and Kent, had dynastic links with the latter, and would, I imagine, have had as much interest in appearance as his contemporaries. Looking again at the plate and other garnet and gold items such as the Kingston brooch, I am wondering whether the cells for the garnets might not have been punched out by a set of hardened tools. It would have saved a lot of time and accounted for their matched sizes.